The Starks' Blog: Happy 7-month Birthday! 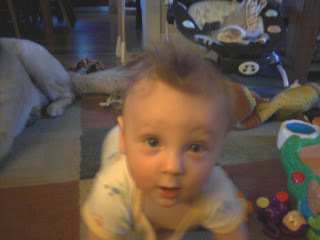 This little cutie, who is sporting his Flock of Seagulls 'do here, is 7-months-old today. Where does the time go? It appears as though he is crawling....is he? He has officially started crawling, not just an army crawl. He hasn't fully mastered it but he is well on his way.